USDA employees, Paul Youngstrum and Eric McTaggart, examine a cover crop radish. NRCS photo by Jody Christiansen. Corn and soybean farmers across the nation saw an increase in yields last year thanks in part to soil health-building cover crops. More than 1,900 farmers responded last winter to a survey about cover crops conducted by the USDA’s North Central Region Sustainable Agriculture Research and Education program and the Conservation Technology Information Center. The results to the survey were released in late fall. Farmers who planted corn in a field following a cover crop had a 3.1 percent increase in yield compared to side-by-side fields with no cover crops. Likewise, soybean yields increased 4.3 percent following cover crops, according to the survey. With assistance from the USDA’s Natural Resources Conservation Service (NRCS), farmers and ranchers are using cover crops to protect soil – their most valuable asset. Over the past six years, NRCS has helped landowners plant close to six million acres of cover crops by providing both financial and technical assistance. Practices, like cover crops, help increase organic matter in the soil. In fact, one percent of organic matter in the top six inches of soil can hold about 27,000 gallons of water per acre. Increasing organic matter increases the holding capacity for water making land more resilient to extreme weather. “By using practices like cover crops that enhance soil health, there will be more soil organic matter development and higher production potential. That results in a higher return on investment and true economic growth,” said Barry Fisher, NRCS Indiana soil health specialist. Cover crop acreage among survey respondents increased by 30 percent per year. Winter cereals – including winter wheat, cereal rye and triticale – were the most popular cover crops, planted by 73 percent of respondents. Legumes, which could include clover, winter pea, vetch and others, were planted by 55 percent of respondents. 63 percent of the cover crop users said they had never received financial assistance or payments to grow cover crops. Yield benefits rose as farmers reported more years of experience with cover crops. The top perceived challenges for cover crops were noted as the time required to plant and manage cover crops, terminating cover crops, and selecting the right cover crop varieties. Cover crops provide numerous benefits in addition to yield increases. They help improve soil health by reducing erosion, increasing soil organic matter content, improving air and water movement through soil, reducing soil compaction, capturing and recycling nutrients in the soil profile and managing soil moisture to promote biological nitrogen fixation. This is significant as farmers reported the three benefits they desired most from cover crops were increased soil organic matter, reducing erosion and reducing compaction. “Cover crops mimic what Mother Nature was doing before man began farming. She always kept herself covered and always had some kind of live roots year round. The closer we can mimic this the better our soils will become over time,” said one survey respondent. Farmers who had four or more years of experience with cover crops saw a higher increase in bushels per acre than those with zero to three years of experience, most likely due to an increase in organic matter. Farmers interested in learning more about soil health-building cover crops and soil health management systems should visit www.nrcs.usda.gov/GetStarted or a local USDA service center. 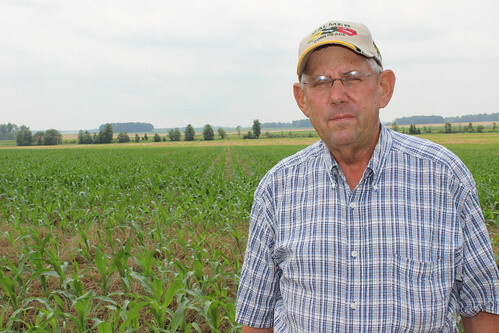 Illinois Farmer Ralph Upton knows first-hand how much soil and crop yields can improve with proper use of cover crops. Upton has been using cover crops since the late 1990s. NRCS photo by Ciji Taylor.